Saltash Funeral Directors Pengelly Funeral Service was formed by Peter Pengelly in 1982 at Landrake, moving to Saltash in 1986. 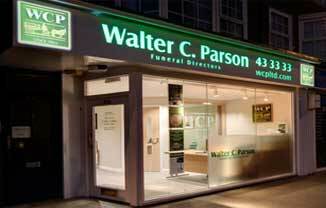 In 2007, Peter entrusted his business to Walter C. Parson, a family business originating from Stoke Climsland, Cornwall. Today, our dedicated team, headed by David Fowell, ensures that Peter’s exemplary standards are upheld. Situated in the heart of Saltash shopping centre, this property was the ideal location to serve the local community of Cornwall, and was extensively refurbished in June 2007. David and Ayesha also serve the Torpoint office. Our Saltash office serves Saltash, Callington, Launceston and the surrounding areas. Feedback. "You made it all so easy, yet so professional"
Feedback. "Ayesha was so caring and compassionate and certainly professional in every aspect of the arrangements"